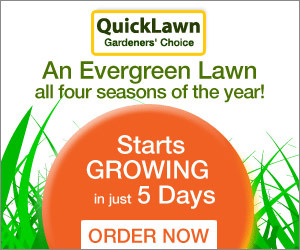 An Evergreen lawn all season long! Works in the toughest terrain such as clay soil, shady areas, sandy soil, high traffic area and even snow! Forget about every other old-fashioned lawn grass that turns tan in summer and fades to straw in winter. Now comes the “4-Seasons” turf-grass – an incredible evergreen show-stopper, developed by University scientists, that keeps its color and texture all spring, summer, fall and winter too! And as if all this isn’t enough of a miracle – a super-growing turf-grass that sprouts within 5 days – covers your entire lawn in a carpet of evergreen velvet. So lush, so thick, so dense and tightly compact, it actually chokes out weeds, dandelions and crabgrass!